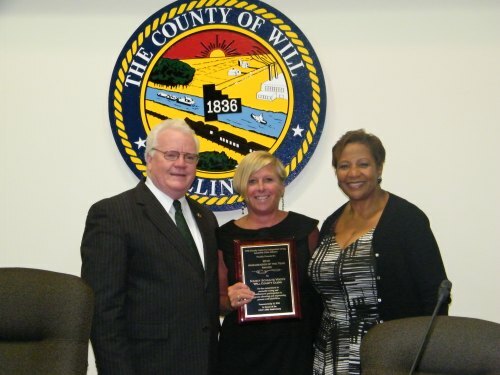 The Will-Grundy Center for Independent Living presented Will County Clerk Nancy Schultz Voots with the Ambassador of the Year award during the July 15 Will County Board meeting. The award is presented annually to coincide with the anniversary of the Americans with Disabilities Act which was signed into law on July 26, 1990. According to Pam Heavens, executive director for the Will-Grundy Center for Independent Living, the award is presented each year to an individual who demonstrates an exemplary dedication to the advancement of equal rights for all disabled people. Through a federal grant, Voots was able to purchase handicapped accessible voting machines for each of the 445 polling places in the County to ensure all disabled residents could participate in elections. These accessible voting machines have special features such as Braille and voice response which allow all disabled residents the opportunity to exercise their right to vote.